One event which can always creates a certain risk for country houses is the bankruptcy of the owner. Once the contents have been sold, apart from the lack of maintenence, an empty house can be a magnet for the thieves who think nothing of stripping fixtures and fittings and even the lead off the roof. So the news that Eshott Hall in Northumberland has now been sold following the bankruptcy of the owners is to be welcomed as hopefully the house will remain in use. 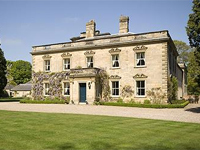 This entry was posted in Uncategorized and tagged country house, eshott hall, for sale, listed, northumberland. Bookmark the permalink.